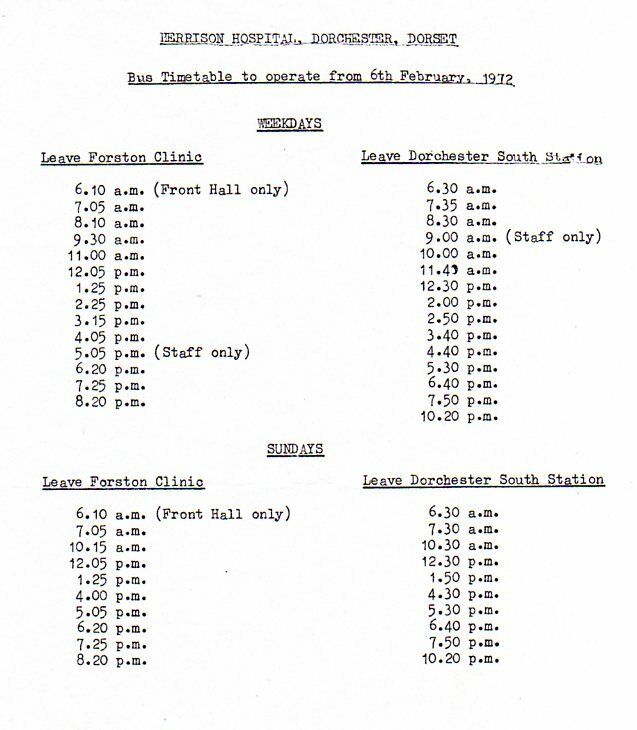 This long standing service ran from the county town of Dorchester a few miles northwards past Charminster to Herrison Hospital and Forston Clinic. Herrison Hospital was the Dorset County Asylum and the first part was opened at Forston House in 1832. By 1843 overcrowding meant a new site with 300 beds was opened at nearby Charlton Down in 1863. Herrison House was opened in 1904 (originally for private patients) and by 1932 the hospital had grown to become an almost self supporting community with its own farm, laundry, ballroom, cinema, theatre and dentist. Thus a bus service seemed to be called for and it started in 1929 with a Morris 14-seater TK3482. 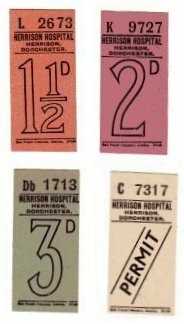 In the the early 1930s the Dorset Mental Hospital is listed as holding a Road Service Licence for the route at that time. The licence stated that the service was "for the use of staff and visitors of the hospital". Initially running on weekdays only some journeys on Sundays were added in 1938. With nationalisation of healthcare provision in 1948 the responsibility passed to the National Health Service and in later years the service was run by the West Dorset Health Authority. The service was unusual in seemingly being exempted from both normal road service licencing and vehicle licencing after 1950. 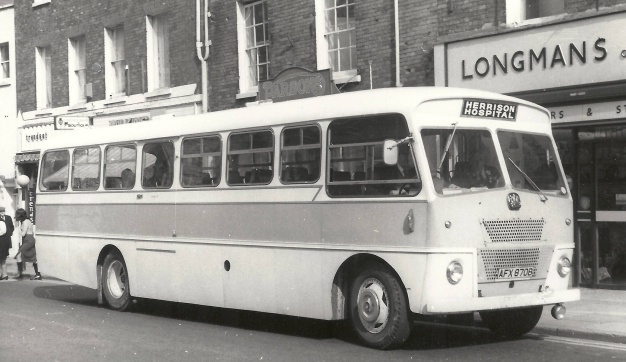 This was also noted from my own personal observation in the early 1970s, the bus had no PSV licence disc, and instead of a road tax disc showed a certificate of exemption; however the drivers wore PSV licence badges. Starting from Dorchester South railway station the hospital bus route passed through the substantial village of Charminster and often seemed - possibly unofficially - to carry some passengers from there to and from the county town; perhaps they were off-duty staff. The 1980s saw increased community-based care and in 1986 Herrison closed to patients, but continued as the headquarters of West Dorset Health Authority. Amongst known post-war vehicles was a Bedford SB5 with Strachan 40-seat body, new in April 1964, AFX870B, which remained in service until about 1975. 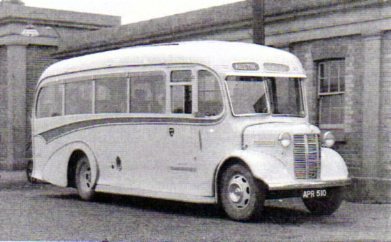 November 1966 saw the arrival of a new Ford R192 Stratton bodied 45-seater GJD598D. A new Ford R1014 32-seater bus was acquired in November 1981, SEL530X; it had a Wadham Stringer body. 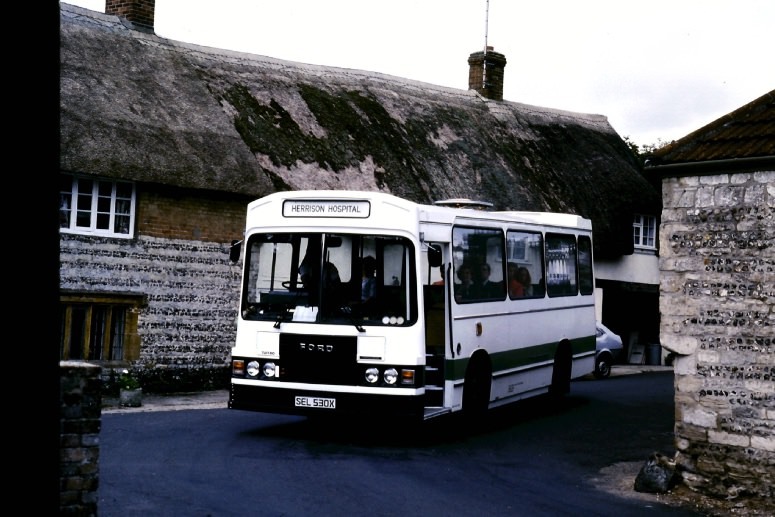 The bus service was later run by the West Dorset Community Health NHS Trust, but with a normal route registration after the West Dorset Health Authority left Herrison in 1992. 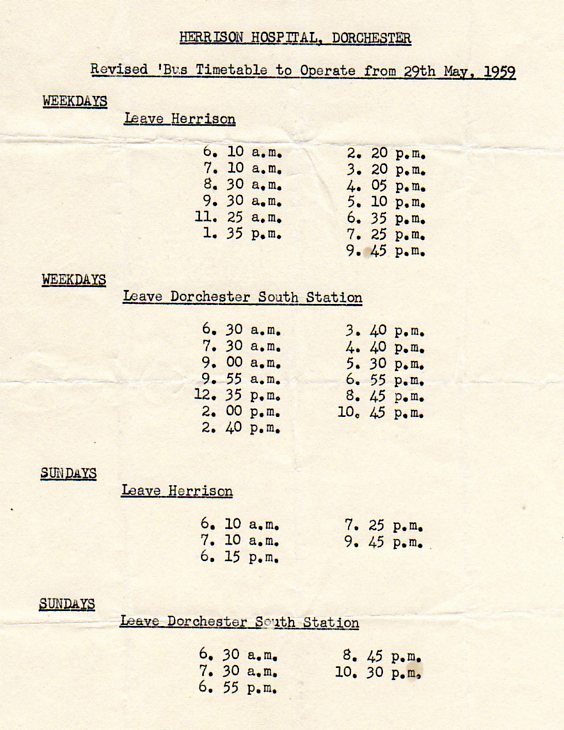 It was then extended to the new Tesco store on the southern side of Dorchester, with a basic publicly available hourly service of eleven journeys each way on weekdays, but only two journeys on Sundays. 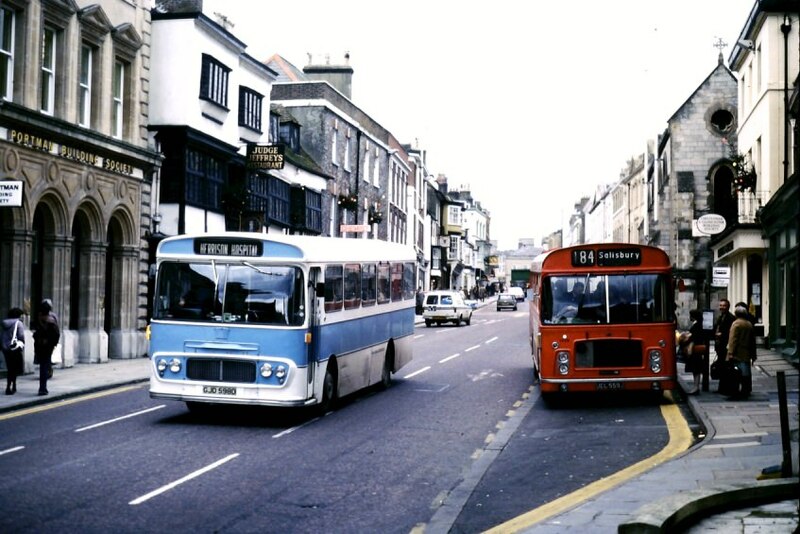 Since 24th October 1994 the route was operated as a normal registered route (service 007) by commercial operator Coach House Travel of Dorchester following the run-down of the hospital facilities. With the subsequent development of substantial housing in both the village of Charminster and in the grounds of the old hospital - the area now known as Charlton Down with a population of some 1400 people - there was a basic hourly frequency in 2011 with nine journeys each way Monday to Friday and eight on Saturday. Forston Clinic is still active and continues to provide mental health care. The bus from Dorchester served Forston Clinic on the outward journey and then went into Charlton Down along Sherren Avenue on the return journey. Where the present day bus turns round was located the Herrison bus garage (where the shop now is - the picture in the link was taken in 1991). From 11th June 2012 the route ceased running as a separate entity and Charlton Down was then only served by diverting the service 216 buses of Damory Coaches to double-run off the Dorchester to Sherborne route. In November 2014 the 216 was renumbered as X11. Operation of the X11 passed to South West Coaches from 24th July 2017. The Coach House Travel business was started in December 1986 by Les Watts who had worked earlier as a driver for Bere Regis Coaches, Trathens of Plymouth and Dorset Queen. Starting small the firm grew through taxis and minibuses to coaches, and ran a fleet of thirty vehicles on holiday tours, day excursions, private hire and local buses (the Dorchester town services and the Herrison / Charlton Down route; the latter still being operated commercially without subsidy). From about 1996 to 2004 some journeys on the Charlton Down / Herrison 007 route were diverted through the villages of Stratton and Bradford Peverell as 007A. This was a not inconsiderable diversion from the usual line of route. Perhaps as Charlton Down developed and grew - the first houses were built around the turn of the 21st century - it was decided to return the focus onto the traditional route again. In August 2011 the sale of Coach House Travel to Go Ahead subsidiary Damory Coaches of Blandford was confirmed, with takeover of both the Herrison route and the Dorchester town services from October. However early in 2012 these routes were deregistered by Damory but subsequently they remained in operation by Damory on a caretaker basis for the county council until June 2012. Damory still operate the service today, but renumbered X11 from 2nd November 2014. The Herrison bus picking up passengers in Trinity Street, Dorchester, as seen in April 2009 by Richard Grantham. 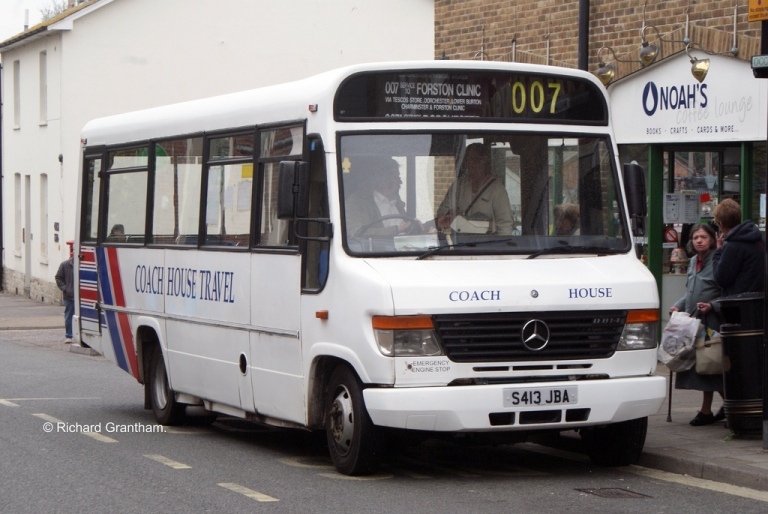 Note the 007 route number! S413JBA was acquired from Bluebird Buses of Middleton near Manchester in 2006. 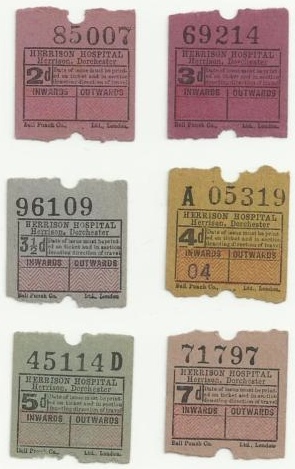 The hospital bus service held a road service licence in the normal way from 1931 to 1950. During these years the hospital was under local control. The NHS was first established in 1948 and took control of the hospital. It is known that government departments had exemption from vehicle licencing (when working in the civil service in the 1980s our pool cars were similarly unlicenced). Presumably advantage was taken of this concession and the road service licence just allowed to expire in 1950 without need for the licence to be renewed. Remember that strictly speaking this was not a public service in the full sense but technically only for staff and visitors. The hospital and the bus service passed from NHS national control back into local control some time after deregulation of local bus services in 1986. Deregulation - unlike the road service licencing of previous years - was a formality of notification without the right of objection from other bus operators. The new Tesco store, to which the bus route was extended at this time from Dorchester South rail station, had by now been opened and it is possible that the West Dorset Health Authority simply took advantage of a commercial opportunity available to them and registered the route as a normal public service available to all in 1992.